Nearing the completion of two months in the Dominican Republic, I’m feeling like this place is becoming a second home, and while I’m getting used to what life is like here, there are some things about working with the poor that I don’t feel like I’ll get used to. 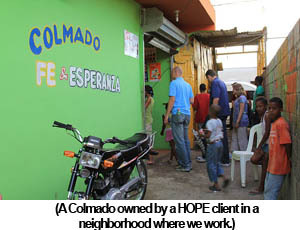 Sure, I’ve been to over 50 of HOPE’s microfinance meetings in the communities, and I’m helping to rewrite and update the training and operations manual. I could walk you through the loan process, how to structure a bank meeting, and how to deliver the Biblical devotionals and business training materials we use. I’m getting used to all that. However, I don’t think I’ll get used to experiencing the look of fear and insecurity I see in the eyes of a new client when I ask them about how much money they have in their savings. Part of the HOPE process is sitting down with each new client and interviewing them about their family and work situation, and we use a specific form to measure their level of poverty. 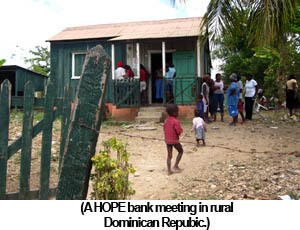 HOPE deliberately tries to reach the poorest of the poor, so when we know that people have a stable job, we make sure they are receiving the services of standard Dominican banks, and focus on people who don’t have a job or access to any banking services whatsoever. Recently, I was working with a loan officer doing these interviews and when we asked the Haitian woman: “Denise, how much money do you have in your savings?” she froze up and got scared to tell us her answer. I think she was afraid to tell us that if she only had about $5 in cash that she hid in her home it meant that we wouldn’t let her get a loan. For us, it is a process of understanding the client’s financial situation to make sure we are assisting the poor, for her, she’s worried that she doesn’t have enough money to join HOPE. In this particular case, Denise is 35 years old, has 3 children, no husband, and her family lives in a one room rented house with no electricity, no water, and she has no cell phone. (Pre-paid phones are very cheap in the DR – $3-$8, so to not have a phone means that someone is very poor). On our survey, our measurement of poverty ranges from 0 – 20. A score of 12 – 20 is average poor, 7 – 12 is very poor, and 0 – 7 is extremely poor. After collecting the data, Denise scored a 2.5. It has been the lowest score that I’ve seen, and when I think about it what it means to her, when she considers the future of her children, I feel the gravity of her worries and concerns . . . I don’t think I will get used to these feelings. HOPE is interested in the whole person and believes that “faith and action” are the ways to carry out the message of Jesus, to preach good news of salvation, and to provide tangible ways to help the poor. So in the example of Denise, we know that she has been making a living selling food on the street. With her small business, she makes only enough money to feed her children and buy enough food to sell the next day. When she joins HOPE, she’ll get a loan that will allow her to buy food in bulk (which lowers her overall cost), help her buy cooking equipment (to help her prepare more food), and offer her clients a bigger, better variety (helping her make 3-4x as much in a given work day). Elevating someone’s economic situation ensures that there will be enough food for the family, enough for money for medicine, and enough money for the future of the children. She replied, “Why don’t you ask her?” So, I went up to this woman and politely asked her why I had seen her almost everyday at most of the bank meetings I’d attended. “You invited your friends to join Esperanza?” I asked. “Yes, I’ve invited a lot of my friends, my neighbors.” she responded. “So how did you invite over 100 women to join HOPE, you have a business, don’t you?” I wanted to clarify. We were waiting for more of the members to arrive, and the meeting was already starting late. Ramona knew she had another meeting she had to attend and was talking to Elena about the tardiness of the other members. Elena gently touched her arm and said, “I will go get them” and started running up the road. So while I’m getting used to living here, I don’t want to get used to the great economic and spiritual needs of women like Denise, nor to the hope that Elena carries with her as she runs to the homes of her neighbors to tell them the Good News. I’m seeing that hope is renewed in each morning that comes. 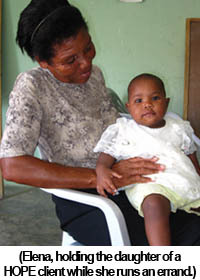 It is the answer that eases the worries of a mother like Denise, it is the strength for Ramona as she visits almost 400 HOPE clients every two weeks, and it is the motivation that encourages Elena to walk in her daily journey through the community. Hope is renewed each day here. I pray that it is for you as well. 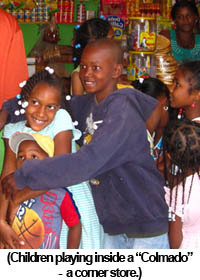 This entry was posted in Dominican Republic, Monthly Newsletter on March 30, 2011 by Aaron.